Sock care: Darn those socks! Holes in my handknit socks! Oh, what horrors! What ever am I going to do? Certainly I can't just throw the pair out. I worked hard on them, I put my sweat and tears into them, they're like my children. I could never waste a perfectly good pair of socks for a couple measly holes. The solution is a word that may strike fear into some of your hearts: Darning. Darning your socks (and indeed, any of your knitwear) is a way to mend holes, or reinforce areas that you expect to get extra wear. So if you know you're going to be hard on your heels, or anywhere else (I actually wear out the ball of the foot), you can darn that area to give it extra strength. Darning is actually not as hard as you might expect, and I actually find the process rather soothing. All you need is your knitted item, a yarn needle, and some matching yarn. If you have the original yarn from your project, you can use that - but if you don't have any leftover, you can use anything that matches. 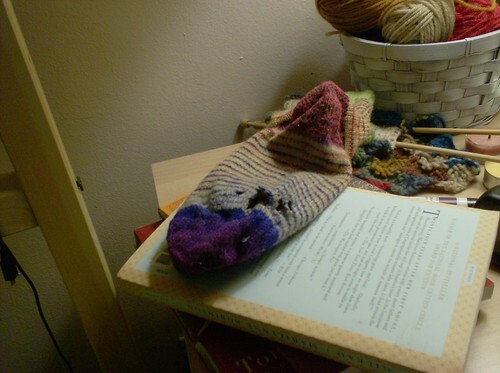 If you're darning the bottom of your sock, the yarn doesn't even need to match! :) No one's going to see it. But if you're darning something like the elbow of a sweater, the original yarn will match best. Many people also use an item called a darning egg (or, a plastic easter egg), but I don't bother. It helps provide a solid surface to work with, to keep the fabric smooth. I prefer keeping my hand underneath, as it makes it easier to manipulate the needle. Now, turn your item inside out. To start, locate the area you want to darn - that's your hole, or your spot that's starting to wear thin. Go out a few rows and columns, and begin weaving your yarn in and out of the rows. Do this for every row, starting from several columns outside your hole. The darned area needs solid fabric to hold onto, otherwise a new hole will start to form. Once you have a web of vertical strings covering your hole, begin weaving in and out of these, creating a fabric to cover your hole or cushion the thin area. This will create a thick patch to reinforce your knitted item. This darn is not seamless - woven fabric looks quite different from knitted fabric. However, it is strong, and if it's on the bottom of your foot, it doesn't need to be pretty. If you want something a little more camouflaged, you can use duplicate stitch to replicate the look of your knitted fabric. 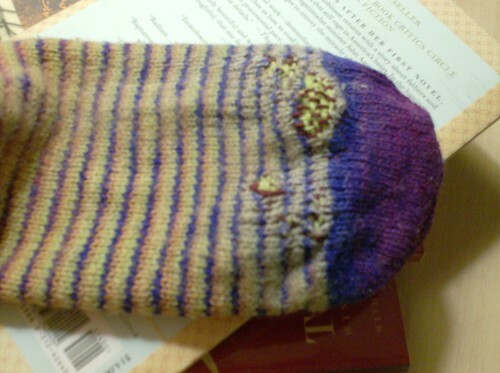 Here's what my newly-darned sock looks like rightside-out. The sock is striped, so I darned using two of the yarns that make up the stripes. It doesn't blend in, but it goes. 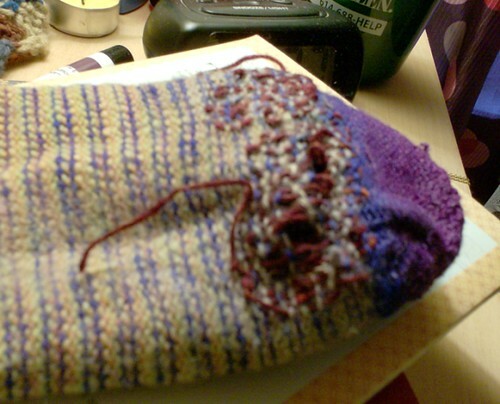 Darning is a new technique to learn, but it can extend the life of your socks considerably. I don't have the heart to throw my handknit socks out when they have a hole, and since I've learned to darn I get to keep them for a longer while yet.